Anodized aluminium frame for durability. Support leg to help stabilize and make loading the kayak easier. Trolley folds down for easy transport - no need to leave it on land, you can even take it on the water with you underneath one of the kayaks bungee straps. Features proper pneumatic wheels, not solid plastic. 26cm diameter, 8.5cm wide. The wheels are easy to detach for storing the trolley away or transport. 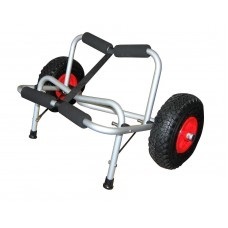 When set up the trolley measures approx: 64cm wide, 33cm tall, 38cm deep (front to back). 64cm wide, 38cm tall, 26cm deep (and even smaller if you detach the wheels).